A few months ago, I wrote about GSN (formerly Game Show Network) straying away from its game show roots by airing a "reality" show chronicling the life of "Newlywed Game" host Carnie Wilson. The show has since come and gone and, if ratings are any indication, "Carnie Wilson: Unstapled" won't be coming back with new episodes any time soon. The ratings woes for "Unstapled," as well as two recent "hidden camera" comedies ("Hidden Agenda" and "Instant Recall"), have caused GSN to return to their game show roots once again in search of a big hit. Their latest effort - a late-night "comedy game show experience" (according to GSN's press release) featuring "celebrity" puppets. I'll repeat that - "celebrity" puppets. In "Late Night Liars," premiering June 10, two contestants face off against four puppets who may or may not be telling the truth. 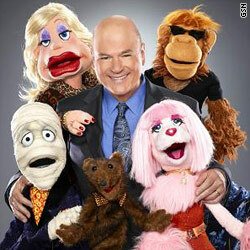 The contestant that can determine which puppets are honest will win cash and prizes. The "Late Night Liars" puppets are the creation of Henson Alternative - an arm of The Jim Henson Company (yes, the Muppet folks) that focuses on content for adult audiences. The show's host is human - actor/comedian Larry Miller, who you've probably seen in both the movie and TV versions of "10 Things I Hate About You." Panel shows are difficult to master. For every "I've Got a Secret" and "Match Game," there are numerous panel shows that failed to make a dent with the audience. For such a show to work, you need the right chemistry to make sure the host and/or panelist doesn't seize control of the show for their own personal gain. In addition, you need a format where the game can stand on its own, and not fall apart in the face of panel wackiness. Add to the fact that the panel consists of puppets made up to mock celebrity stereotypes, and you end up with a show that is definitely a risk for GSN. Will it work? I'm not sure, but I'll definitely check out at least one episode. Besides, I'm a Larry Miller fan (he's a master scene-stealer with the knack of providing bright spots to dreadful films). Will you check out "Late Night Liars" when it premieres next month? « Previous entryTV Recap: Did this week's 'Glee' make your list? A very original idea. Sounds like it could be a lot of fun. I'll give it a try! Better a risqué puppet show than more Carnie Wilson blather. Now if only we could get rid of that pubescent-sounding idiot constantly screaming "Got a minute" (like someone has a firm grip on his family jewels) and cracking mirrors in the house. What was really enjoyable were the old B&W kinescopes of the 1950's & 60's classics like Password [There was never a classier host than Allen Ludden!]. There must be dozens of old shows that could be dragged out of storage and reintroduced to new generations. The new ones like "Catch 21", with its bad-grammar, constantly shouting host, don't hold a candle to the old classics (and are pretty cheap with their prizes too!). watch the original. You know, when televeision game shows were good.